Great Sanuki udon in Kagawa landed at Tokyo ! After we had coffee at Turret Coffee, we walked to Yutakucho and went to Kanda by Yamanote line. Our target was a udon very new shop named Kagawa Ippuku that is open August 28th. 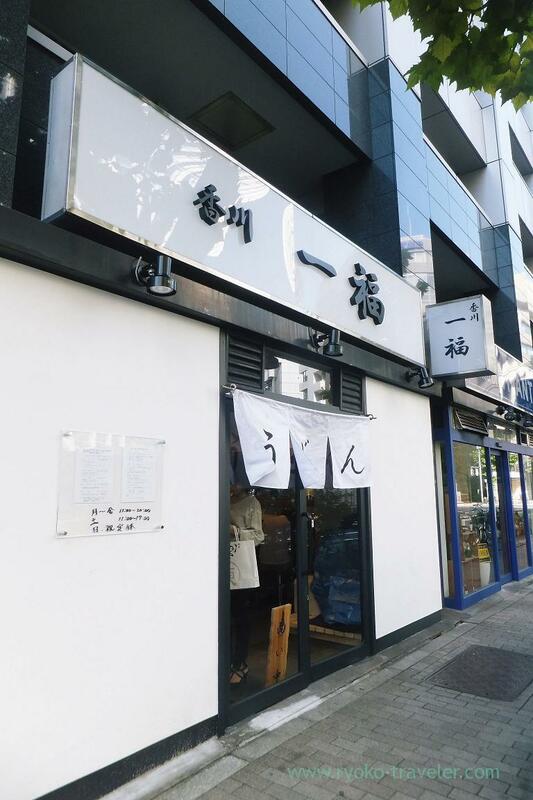 We heard that it is tremendous popular Sanuki udon shop in Kagawa. 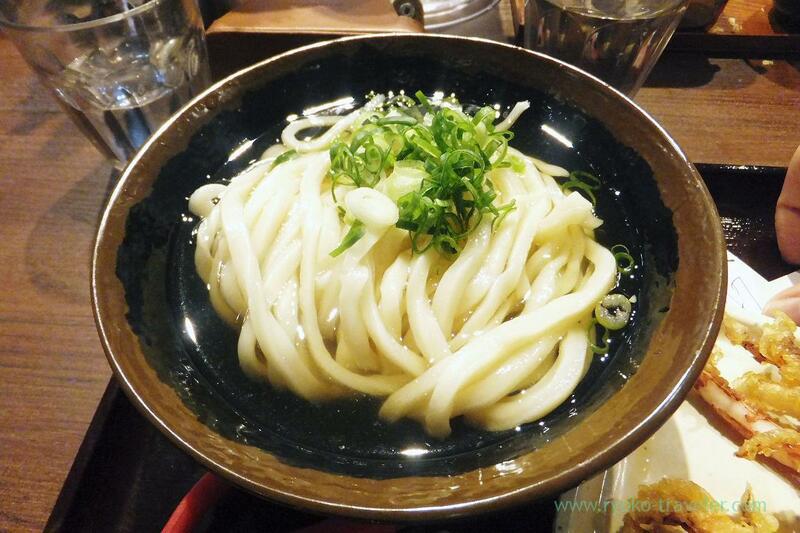 Speaking of Sanuki udon, we remember we can eat it at very inexpensive price about 100 or 200 yen. But this Ippuku serve rather expensive udon compared with them. Ippuku’s udon is not so chewey like another Sanuki udon and easy to eat for beginners, I heard. It was 2 p.m. We heard that we have to wait so long in the long long line. But we found there was no people waiting in front of the shop at a distance. We also heard that the shop close before the closing time because of running out of udon so frequently. So, we thought it already closed, but anyway we went to in front of the shop with disappointing. It was many vacant seats ! Half of seats were vacant ! Oh my ! I bought two tickets at the vending machine with exciting. There’s counter table along the wall and large table. We were three, so we were seated at the large table together. The intervals of each chairs are comfortably wide ! Well, just after we were seated, much visitors came successively and there were some people waiting for seats. We were very lucky. Maybe the arrival time of train concerning, too. He ate at Kashigashira with us an hour before it ! Hiyakake is “colden udon in cold soup”. It is said that this is the best way to taste udon. Cold udon, cold soup and green onions. That’s all. I also pretended to be an expert,,,, but I like my soup warm all the same. This soup was so tasty. It had plenty of flavors of flying fish ! Certainly the udon wasn’t so chewey and this was my taste. Grated ginger, tenkasu and another seasoning like shichimi pepper on the table. So, we can enjoy various tasts with on bowl of udon. 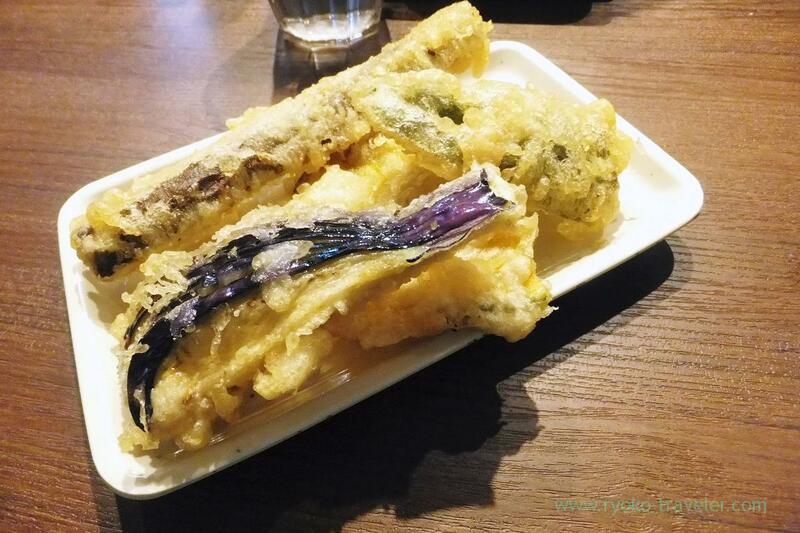 The scissors were served together and I cut the tempura with it and eat. 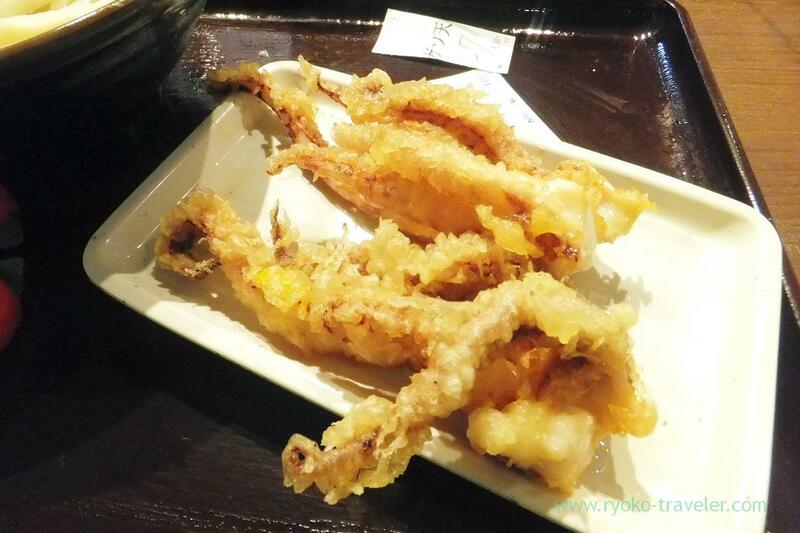 The coating was crisp and the squid was good. Before that ! I’ll go Kagawa the end of this month !